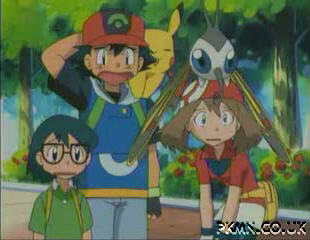 Ash arrives in Littleroot Town and meets Professor Birch. Pikachu accidentally destroys May's bike. May chooses a Torchic and joins Ash. Ash arrives in Petalburg City and has a practice battle against Norman. May's brother Max joins the group. Jessie and James release Arbok and Weezing. May decides to enter Pokémon Contests. Ash beats Roxanne and earns a Stone Badge. Ash challenges Brawly and is beaten. Misty's Wurmple evolves into Silcoon. Jessie's Wurmple evolves into Cascoon. May's Silcoon evolves into Beautifly. Jessie's Cascoon evolves into Dustox. Ash defeats Brawly and earns a Knuckle Badge. May loses her first Pokémon Contest. Ash defeats Wattson and earns a Dynamo Badge.